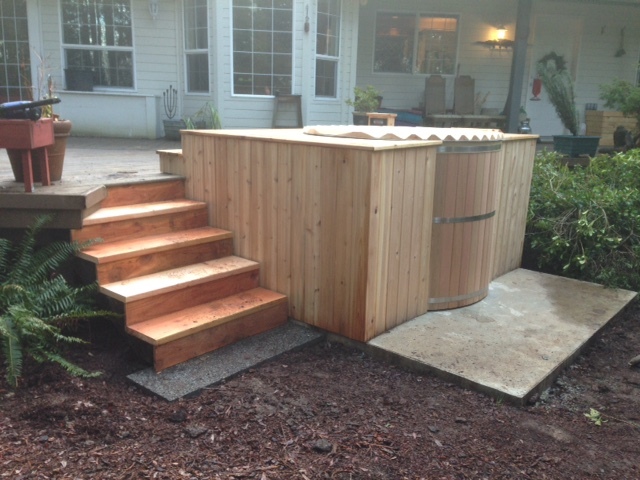 Put together this cedar stave hot tub and built the deck and stairs for a couple over the Christmas season. Tub comes in a half dozen boxes and you have to assemble it like a barrel, which I guess it sort of is. It looks nice enough. Has jets, a light, benches. It reminds me of the wood fired tubs you can get except it has a standard electric heater and pump system. The surprising part is it has virtually no insulation compared to your traditional fibreglass/acrylic tubs. There is an 1/8″ foil backed thermal blanket between the cedar staves and the liner, same wrapped around the plumbing. That’s it. The manufacturer claims $60/month to heat. I hope that’s true, glad it’s not my power bill though.